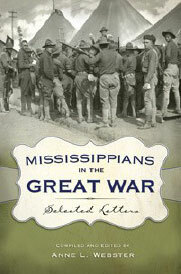 Author Anne Webster will discuss Mississippians’ involvement in World War I during a presentation at the State Law Library in Jackson at 10 a.m. June 22. The Law Library is in the Gartin Justice Building at 450 High Street in Jackson. Webster wrote Mississippians in the Great War: Selected Letters about the experiences of some of the more than 55,000 Mississippians who served as soldiers, aviators, sailors, nurses and YMCA workers a century ago. Some of her research relied on letters home written by ser-vice members and published in local newspapers, particularly Greenville, Natchez and Pontotoc. Webster retired as director of reference services at the Mississippi Department of Archives and History. Nov. 11, 2018, will mark 100 years since the end of World War I. The book was published by University of Mississippi Press in 2015.